Phillip Gage is one of four people facing sentencing for robberies at four banks in Maine and New Hampshire. A Berwick man who robbed banks in New Hampshire and Maine as part of a four-man crew pleaded guilty Tuesday in Portland to armed robbery and gun charges. Phillip Gage, 46, was the last of the four robbers to plead guilty in U.S. District Court, though it was his capture on Oct. 31 that led to the arrests of his three accomplices, according to court records. Gage was the only one of the four who was accused of having a role in all of the bank robberies from Aug. 21 to Oct. 26, at Citizens Bank in Somersworth, N.H.; Peoples United Bank in Exeter, N.H.; Kennebunk Savings in Eliot; and Ocean Communities Federal Credit Union in Sanford. After Gage’s arrest, he gave authorities the names of his accomplices – Daniel Barry, Marvin Eugene Ansteth Jr. and Brianne Mone, all of New Hampshire. Barry was accused of supplying the guns that Gage used in both Maine robberies, a .44-caliber revolver that was used in Eliot and a .22-caliber revolver that was used in Sanford. Both guns were found in a search of Barry’s home. Barry also was accused of assisting Gage inside the bank during the robbery in Eliot. Ansteth and Mone were accused of being getaway drivers for more than one of the robberies. Gage is accused of pointing the gun at a teller in the robbery in Sanford and escaping with $8,574, according to the court records. During the Citizens Bank robbery, Gage passed a note saying, “I have a bomb and a gun if you say a word you will die.” He escaped with $3,132.80, according to court records. In the People’s United Bank robbery, Gage passed a note saying, “There’s a bomb in the trash can, keep it quiet.” He stole $1,451, records show. Gage has prior felony convictions – for a robbery in Florida in 1986, an assault in Maine in 1999, possession of a firearm by a felon in Maine in 1999, and attempting to commit a Class B crime in Maine in 2002, according to the U.S. Attorney’s Office. 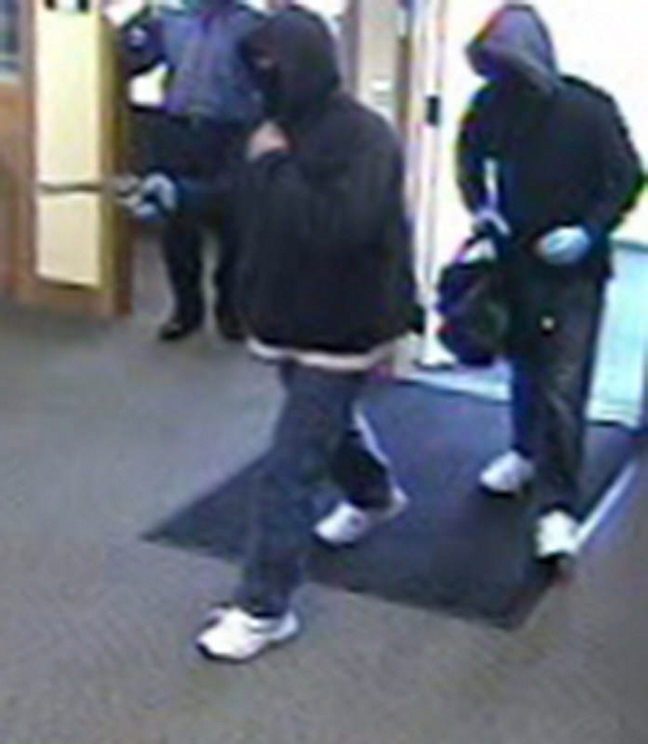 Barry and Mone pleaded guilty in December for their roles in the robberies. Ansteth pleaded guilty in January. They have yet to be sentenced. Gage faces as much as 25 years in prison and a $250,000 fine on each armed bank robbery charge, a mandatory minimum of 15 years and up to life in prison for a firearm possession charge, and a consecutive mandatory minimum sentence of seven years and up to life for using a firearm in an armed bank robbery.